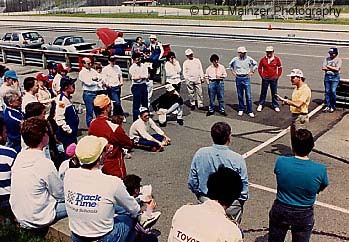 Racing Steering Wheel Theory ...it's all about Friction Circle. An entire book can easily be written on the scientific discoveries made while building custom-molded steering wheels for the world's best drivers. In these short paragraphs below, you will learn the reasons why a custom-molded steering wheel is superior in all aspects when compared to a conventional wheel. Dellis' background includes 2-1/2 yrs teaching at Skip Barber, and 6-1/2 years leading the classroom at the Bobby Rahal TrackTime Driving Schools. Fact 1: Resistance is Your Friend. While turning, the amount of resistance you feel through the steering wheel is the amount of traction (read: cornering force) available under the front tires. This is due mainly to castor and the fact that the trailing edge of the contact patch is behind the steering axis. The resistive force you feel is called self-aligning torque. Fact 2: Tire Cornering Force Depends on How Much it Slips Sideways. Turned tires don't go exactly where they're pointed. They try to, but they slip sideways slightly. The difference between where the tire is pointing and where it's actually going is called the slip angle....similar to a plane flying in a crosswind. Fact 3: Forces Build Up and then Go Away as a Tire Goes Past the Top of the Mu-Slip Curve. The graph that defines the relationship between the amount of side slip and the cornering force is called the Mu-Slip curve, since mu (µ ) is the symbol engineers use for friction. It's shaped like a bell curve and levels off as the tire converts itself from a turning device into a brake as it slides sideways. If you're completely sideways sliding down the track, the tire's force is about the same as if you locked up your brakes in a straight line. Facts 1, 2, and 3 mean that the tire builds up cornering force as you turn the steering wheel, then the resistance you feel through the steering wheel will begin to level off and then fall off to about 70% if you turn the wheel too much. 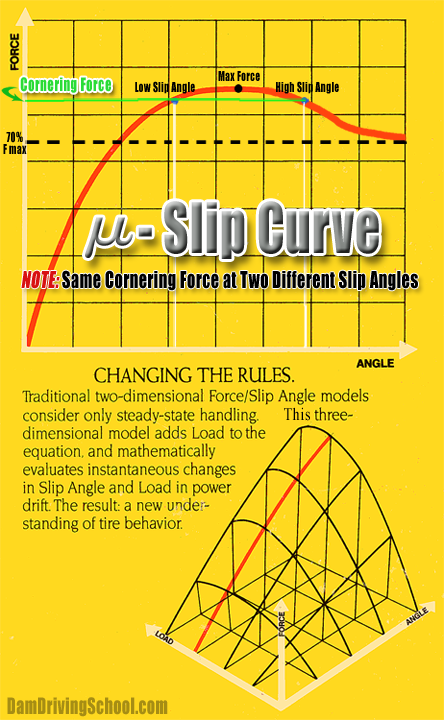 The mu-slip curve and Friction Circle are inter-related and define how much power can be put on the ground. All other factors being equal, the driver who puts the most force on the ground, and shortens the distance to the finish line...without crashing ;-)...wins. ...so you spend the least amount of time cornering. Therefore, all other things being equal, your ability to detect steering wheel resistance is key to lowering lap times. PersonaGrip was EMG tested and showed a 54% reduction in grip effort in sliding mode. Electrical activity for the three muscle groups is shown for sliding and twisting forces. On November 22nd, 1994, PersonaGrip was EMG tested to determine how much energy is expended when trying to control an object. 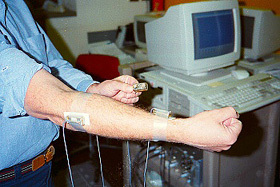 A standard handgrip was used on a Lido Work Simulator for baseline data in three modes: sliding, twisting, and compression. The standard grip was then removed, and a properly molded PersonaGrip was installed. The results showed that 54.3% less effort was expended when trying to control an object that was trying to slide through the test subject's hand; and, when the object tried to twist out of the subject's hands, the reduction was 43.5%. Compression tests did not reveal any significant energy savings; however, the test subject reported that it felt significantly more comfortable. 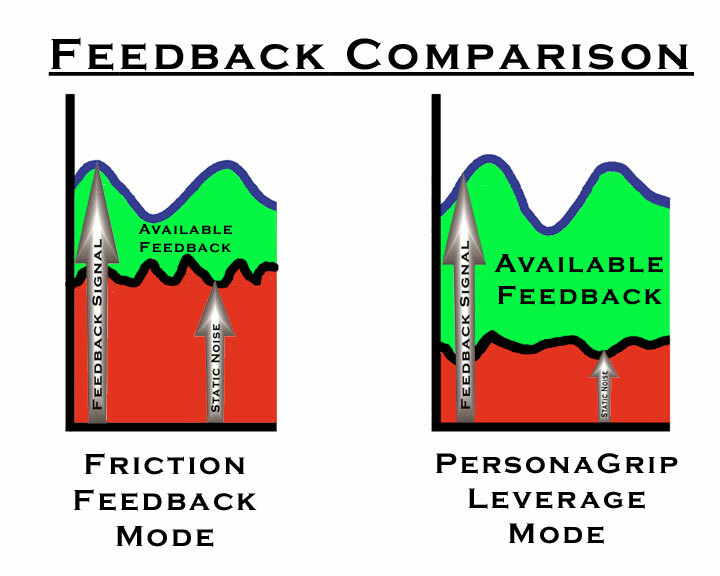 If a muscle expends most of its energy trying to control an object, then its ability to read feedback from that object is reduced. In other words, the ability to read feedback decreases with increasing muscle tension in your forearms. If self-aligning torque --described in Fact 1 -- is the feedback, then if you can relax your grip, your brain is better able to detect changes in the resistive feedback signal. Engineers call this an improved signal-to-noise ratio. Since you're trying to stay on top of the nearly flat portion of a bell curve (mu-slip), you need the ability to detect very minute changes in feedback if you expect to extract the most cornering force from your tires at any given moment. Improved Signal-to-Noise Ratio is possible since Leverage effectively reduces "noise" which is the wasted effort from the High Control Force needed when turning a non-molded steering wheel. Wasted Effort is needed with Conventional Steering Wheels since they're harder to control. If you are in a turn and relax your grip, the wheel will slip through your hands as the self-aligning torque tries to straighten the wheels. Conventional steering wheels slip through your hands because friction is your only mode of communication with it. Early attempts to reduce slippage involved increasing the coefficient of friction between the hand and the steering wheel by using gloves. F = µ (mu) x N <==This is the formula for calculating the force due to friction. In plain English, N is the force pushing down on an object, and mu, µ, is the coefficient of friction...which is basically a comparison of the force it takes to slide something across a surface, compared to the force it's imparting ON that surface. If you cut a steering wheel cover on the inside and fillet it open so it's flat on a table, it's easier to see how the friction formula works. Your hand would now be resting on top of the cover. So, the force downward on the cover becomes the equivalent of squeezing grip tension. Now, if you remove the downforce -- by lifting your hand up slightly -- you can't move the cover since your hand is floating over it. If you stick two pieces of bubble gum on the steering wheel cover laying on the table to either side of your hand, NOW you could slide the cover side-to-side without pressing downward. In the case of the steering wheel, you could relax your grip, still maintain control, and improve your ability to detect the limit with greater confidence. The difference is nearly impossible to describe. It's so confidence-inspiring, that the limit becomes obvious in the driver's mind. But, until you feel it for yourself, you cannot begin to imagine how big a difference it makes since your basis for evaluation is the old friction paradigm. Feeling IS Believing when shifting the paradigm from friction to leverage in racing steering wheels.